It was the first time the Dockers had claimed an opening-round victory since 2015 as forward Cam McCarthy booted a career-high five goals. McCarthy kicked four majors in the first half and finished with a running goal from outside 50m as Ross Lyon's side went on to post a 21.15 (141) to 9.5 (59) victory. 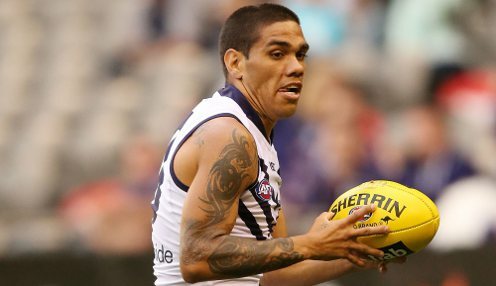 Michael Walters kicked three goals while speedster Bradley Hill was a big part of their success, finishing with 28 possessions and a goal. The home side kicked 10 goals to three in the second half and recorded their biggest victory margin since they hammered Brisbane by 83 points in 2016. It was a bad day at the office to say the least; if you walk into the locker room you'll see how deflated the boys are. Though captain Nat Fyfe had a long spell on the bench in the final term he finished with a team-high 32 possessions, 10 clearances, and eight inside 50s. The Kangaroos didn't recover from losing defender Ed Vickers-Willis to a suspected ACL injury in the first quarter. He will require scans after his left knee buckled in a marking contest. The visitors turned the ball over repeatedly as Fremantle won the inside 50 count 68-47. North teenager Bailey Scott impressed on his debut to finish with 21 possessions and two goals. Fremantle had a 39-point lead at the main break, and pulled further away in the third term when they kicked five goals to one. It left Kangaroos captain Jack Ziebell vowing the team will bounce back quickly in round two. "It was a bad day at the office to say the least; if you walk into the locker room you'll see how deflated the boys are," said Ziebell. "That performance is not what this group stands for and our challenge now is to put that disappointment behind us focus in on our match against Brisbane in seven days time." North Melbourne are 100/1 to win the Grand Final. The Kangaroos are 17/20 to win their next game against Brisbane, who are 1/1.